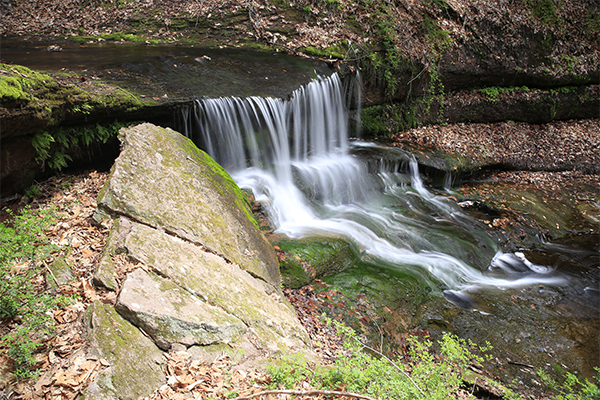 Southern Connecticut has a few small but delightful waterfalls along pretty and clear streams, and this is one of them. 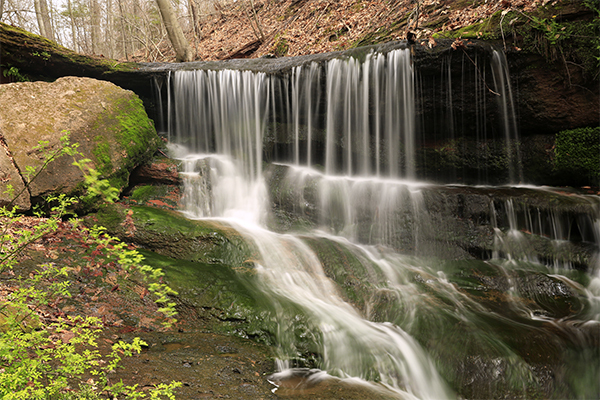 There really is not anything particularly alluring about this small waterfall, but hiking to the falls involves strolling along a well-signed 2.3 mile loop in the largest of Wallingford's network of conservation properties (68 acres). The woods have some attractive segments, and the stream is arguably one of the purest in the county. 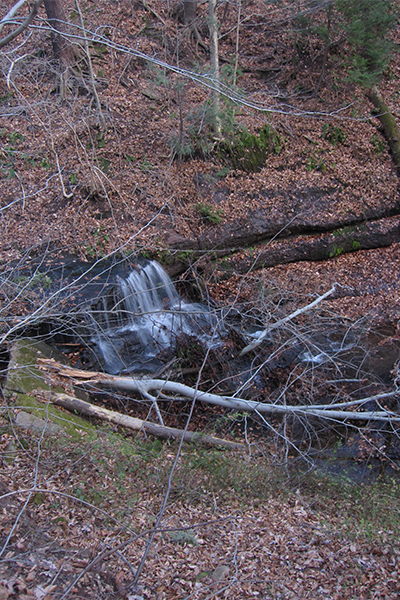 The falls are located in a pretty and deep ravine, but the trail only travels along its rim. As such, the 13-foot plunge can only be safely seen from about 35 vertical feet above it. The falls hang off an overhanging ledge quite dramatically for its small size. From a birds-eye vantage point, it looks like there was a small space behind the falls, which is quite rare for New England. Scrambling to the base of the falls is generally considered dangerous, and is therefore discouraged. From the parking area, head straight (north) into the woods onto a trail that seems to alternate between being called the Charlie Uznanski Trail and the Orchard Glen Trail. This trail is often marked with white markers that have the letters WLT and a Christmas tree symbol on them. The trail soon swings right and then left almost immediately thereafter. Continue following the Charlie Uznanski/Orchard Glen Trail and you will cross a 2-foot wide seasonal stream and then reach a more significant brook 0.2 mile from the parking area. 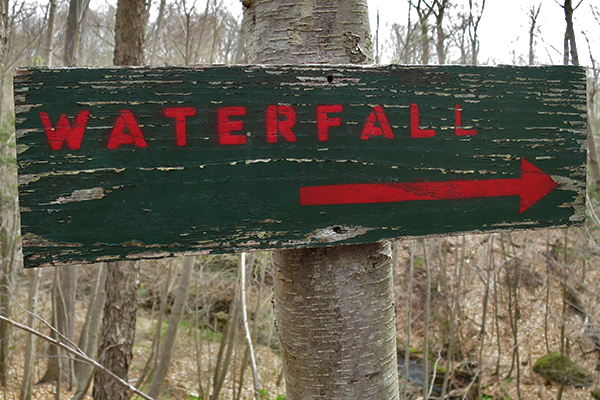 Cross the brook and decide whether you want to proceed directly up a steep hill or hike 200 feet upstream to the right, where a junction that is currently marked with a sign that says "Waterfall" will take you left and uphill to where the steep hill trail connects with it. Continue along the trail for 300 more feet and you will reach the eastern junction of the Falling Waters Trail loop. Stay straight on the Charlie Uznanski/Orchard Glen Trail since the "Falling Waters Trail" is a bit of a misnomer because there are no waterfalls visible along it. In only 0.1 mile you will reach the (often unmarked) western junction of the Falling Waters Trail loop. Stay straight on the Charlie Uznanski/Orchard Glen Trail yet again. Continue hiking and in 0.1 mile you will reach an open area that crosses underneath power lines. From the power lines, you can hike the Spruce Glen loop in either direction. My directions will assume you continue straight and hike the loop counterclockwise. Cross the power lines and re-enter the woods straight ahead of you. Continue in the woods for 0.1 mile and take a left onto the Spruce Glen Trail at a fork. Continue hiking north along the Spruce Glen Trail for 0.5 mile (with Spruce Glen Brook sometimes visible on your left) and you will reach a bridge over the brook. Cross the bridge and continue the loop by hiking downstream towards the falls with the brook on your left. In 0.2 mile you will need to take a left onto a spur trail that loops over to a view of the falls. At this point you've hiked a total of about 1.3 miles. It is possible to scramble down to the base of the falls but this is not recommended due to the steepness of the terrain. Scrambling will undoubtedly cause more erosion to the trail, which is never a good thing. 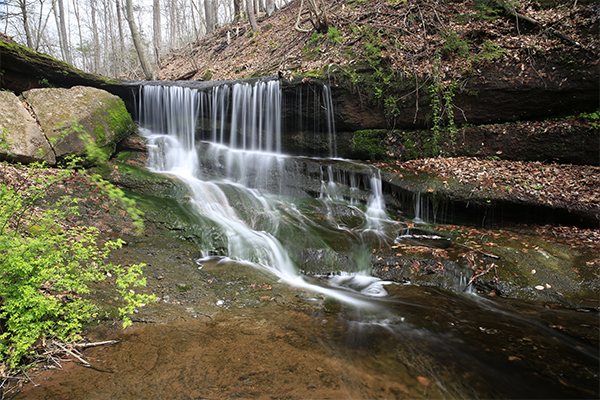 After you are done visiting the falls, continue downstream and the spur trail will reconnect with the main trail in 150 feet, or about 300 feet south of where you originally turned onto it. Continue hiking south along the Spruce Glen Trail for 0.5 mile and it will return you to the original junction at the power lines you passed earlier. When you reach the start of the loop at the junction at the power lines, take a right and re-enter the woods, following the original way you came back to the parking area on Barnes Rd. While these trail instructions may seem complicated, the trail is very well-blazed and has excellent signage on all segments. You should not have any problem with navigating this loop. The Wallingford Land Trust does offer a free online trail map on its website if you need it. Long pants are recommended on this hike as there are some short sections with thorny bushes that will likely brush up against you. They were not a huge nuisance, but some visitors may find these very short sections of trail disagreeable. From CT-15 in Wallingford, take exit 66 for US-5. Take US-5 south for 0.3 mile and turn left onto an access road that leads to CT 68. Go 0.1 mile along this access road and take a left onto CT 68 east. Take CT 68 east for 0.3 mile and take a left onto Barnes Industrial Park North Rd at a set of lights (this is often also called Barnes Rd). Follow Barnes Industrial Park North Rd north for 0.75 mile and you will find a small paved area directly in front of you at the end of the road. It is currently marked by a trail billboard and a sign that says "Orchard Glen". There is enough parking for three or four vehicles directly in front of the sign. To get to Wallingford, take I-91 north from New Haven to CT 40 northwest to CT 15. Follow CT 15 north into Wallingford.